When you click the View More Details icon, the officer can view more information about the vehicle in question. Information such as Make, Model, Color, Address, Approved Parking Start Date and Approved Parking End Date. Adding a NEW ENTRY to the Overnight Parking list is quick and easy. Just click on “+ ADD NEW” button and you will be presented with a data entry dialog box. Start by entering a license plate number. 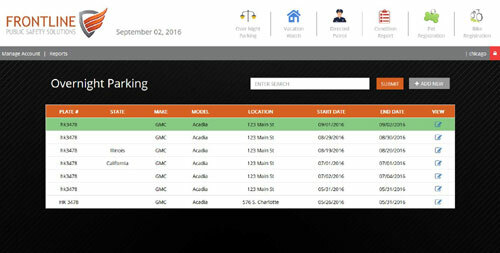 The FRONTLINE system will automatically check the license plate number against our database and fetch any corresponding results. If the license plate was previously entered, fields such as Make, Model, Color and Vehicle Location will be auto-filled. If the entry is new to the system, just add the details into the dialog box and the data will be saved for future reference. 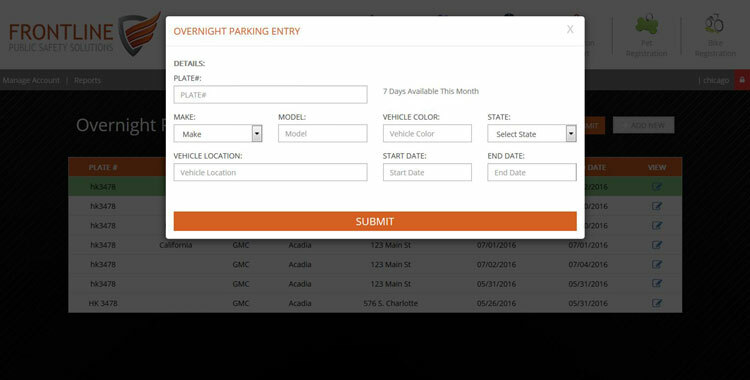 The System will also inform you on how many Overnight Parking passes are available this month. Each community varies in the number of days that they allow vehicles to require approved overnight parking in the street. 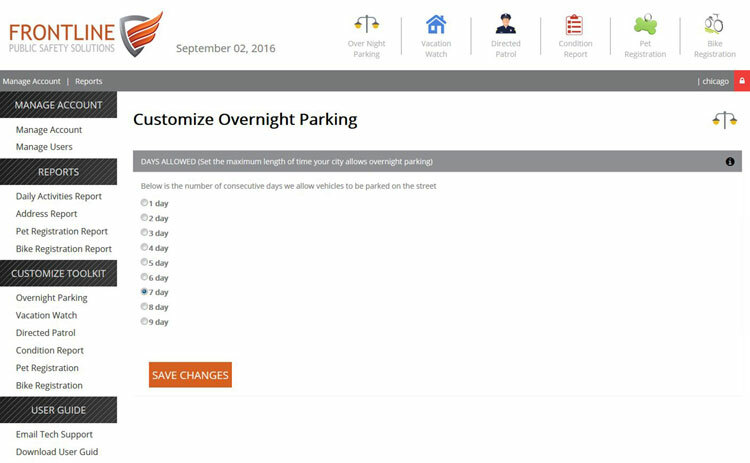 In the “Manage Overnight Parking” section, administrators can choose the number of days from the list and click “Save Changes”. This will update the entire database and will show the number of days a vehicle has used this service.